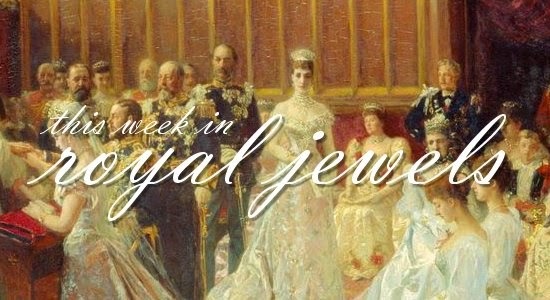 We've got royal earrings and necklaces galore this week -- be sure to vote for your favorites in the poll below! 9. Queen Letizia of Spain wore her Tous pearl drop earrings at a journalism awards ceremony on Tuesday. 8. At Ascot Racecourse on Friday, the Countess of Wessex wore pearl cluster earrings by Dior. 7. Infanta Elena of Spain wore a brightly colored necklace and matching earrings in shades of blue and green in Seville on Monday. 6. Queen Maxima of the Netherlands also chose blue-toned beads on Monday, this time for a meeting with President Kagame of Rwanda. 5. For a luncheon on Tuesday with President Erdogan of Turkey, Queen Mathilde of the Belgians wore diamond earrings. 4. On Friday, Queen Sofia of Spain wore a black and white statement necklace and a glittering sunflower pin for the annual Red Cross fundraiser in Madrid. 2. At the start of a state visit to Lithuania on Wednesday, Queen Silvia of Sweden wore pearls (including Princess Sibylla's pearl necklace) to sign a guest book. 1. My top spot of the week goes to Princess Beatrix of the Netherlands. She glittered in diamonds -- including the family's floral bracelet, which some have speculated was a gift from the Sultan of Brunei -- during a visit to Boston, where she attended an exhibit of paintings by Rembrandt and Vermeer.